Occasionally we receive calls from people who want to remove fiberglass cloth from wooden structures. The fiberglass on the bottom of a stripper canoe has worn out or the fiberglass and polyester on the deck of an older wooden sailboat has delaminated. 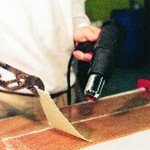 The techniques described here work well for removing 1 or 2 layers of fiberglass cloth from wood surfaces. This process involves heating the fiberglass and resin layer. It should be attempted only in large open spaces where adequate ventilation is provided. Resin coatings can give off hazardous fumes when heated enough to discolor or char. Fortunately, the fiberglass/resin layer does not need to be heated to that degree and should not involve burning the resin for this removal process. Keep a fire extinguisher close by just in case. Set up fans far enough away to provide a gentle breeze, just enough to keep the fumes moving away in the event you should overheat the resin. Be sure to use exhaust fans and make up air if working in a small shop. You’ll need a high-quality heat gun and leather or jersey gloves for this removal process. Paint-stripper type heat guns work well. Use the heat gun to soften the fiberglass and resin layer. Begin by heating the fiberglass along one of the edges. Gently force a putty knife or chisel under the fiberglass. Once an edge is lifted, pull up gently on the fiberglass with a pair of pliers. Use one hand to pull on the fiberglass while heating the resin and fiberglass with a heat gun in the other. Direct the heat just ahead of the point where the glass is peeling off. To achieve the ideal removal process for your project, experiment with how far you hold the heat gun from the surface, how long you hold it there and the rate at which you pull the fiberglass from the surface. The fiberglass is ideally removed in long narrow strips 4 to 6 inches wide. Score the fiberglass surface with a utility knife in a direction parallel to the wood grain. You don’t need to cut all the way through the fiberglass. 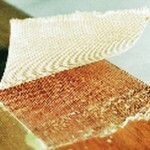 Glass fabric will tear along the cut just as paper tears along a perforation. Avoid cutting through the fiberglass into the wood below especially if the project will be given a natural finish. 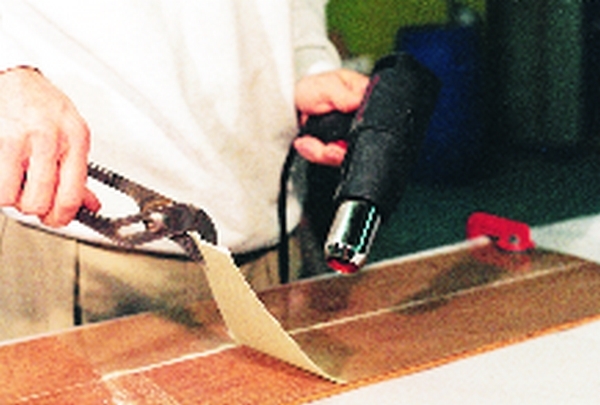 Cuts that penetrate the wood will show when you recoat the surface with resin and fiberglass. The temperature at which resins soften will vary with resin type. Polyester resins have heat deflection temperatures around 160°F to 170°F. Room-temperature cured epoxy usually softens sooner with heat deflection temperatures between 120°F and 150°F. After you have removed all the fiberglass, remove the remaining resin on the surface with a heat gun and scraper. You can use a sharp cabinet scraper to remove stubborn resin. Sand the surface to expose the original wood tones. Coat the entire wood surface with epoxy just before filling low areas. This way you can more accurately match the original color of the wood strips or veneer by adjusting filler color. Small areas where the wood has pulled out will be filled with clear epoxy when the project is reglassed, and need not be filled before fiberglassing. If you are giving your project a natural finish, remember to use 105 Resin with 207 Hardener when fiberglassing wood projects. This combination is formulated to cure clear under a variety of conditions and is particularly well suited for clear coating/laminating applications. Use a more powerful heat gun. Work more slowly. Allow more time for the fiberglass/resin layer to heat up before pulling on the fiberglass, or hold the heat gun closer to the surface. Remove the glass on a slight angle to the grain direction of the wood to reduce wood peel or pull from the opposite direction. In stubborn areas, force a thin dull putty knife under fiberglass that has been softened with heat. If you have questions about removing fiberglass cloth, feel free to call us toll free at 866-937-8797. Using a pair of pliers, pull on the fiberglass with one hand while heating the resin and fiberglass wit a heat gun in the other. The fiberglass will pull free from the substrate, leaving a layer of epoxy still attached to the wood. This entry was posted in Fiberglass Boat Repair, Shop Tricks and tagged #8, Epoxyworks #8, Fall 1996, Tom Pawlak on June 14, 2014 by ewadmin.